Should we teach to the test? When it comes to speed training, YES. “No Child Left Behind” was a disaster. “Race to the Top” will be worse. Arnie Duncan is a fraud. Barack Obama is all talk. Common Core illustrates a fundamental mistrust of teachers. Standards-based education is ruining the way we teach and learn. The task of teaching is never quantifiable. My best teachers were artists, they did not paint by number. When teachers had power, schools produced some of the best generations this country will ever know . 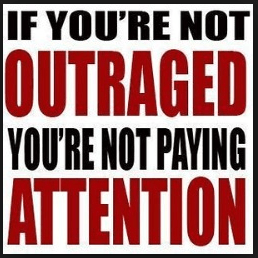 Now politicians and corporations have taken control. Teachers should rise up in opposition, instead they cling to security. Teachers are so obedient. Click to enlarge. I have noticed that students cheat more than ever. It’s not about the learning and acquisition of skills, it’s all about achieving high test scores. How do you test for a love of reading? How do you test for creativity and curiosity? How do you test for the arts? “Education is the lighting of a fire, not the filling of a pail.” -William Butler Yeats. Tests scores don’t measure learning, but they are great predictors of future tests scores. So how is speed training different than science, math, history, and English? Unlike learning, speed is truly quantifiable. We can measure speed. Our goal is 100% defined … GET FAST. 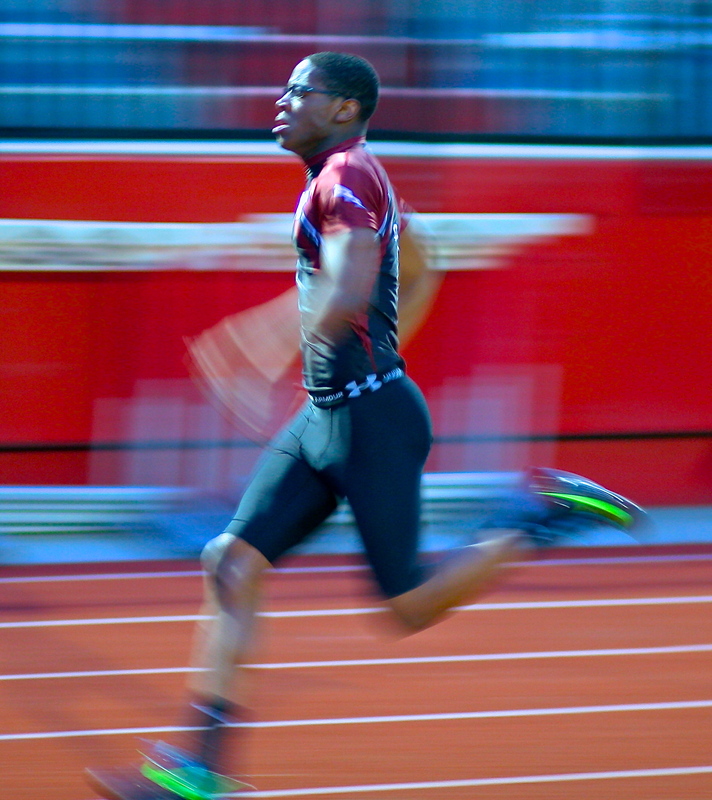 Sprinting is the ultimate outcome-based education … get fast and measure it early and often. RECORD, RANK, AND PUBLISH … and remember, test scores are great predictors of future test scores. Speed improvement will be followed by more speed improvement. It’s all about direction. In speed training, TEACH TO THE TEST. You don’t get fast by running slow. Fast guys win. Trudging though workouts improves trudging, not sprinting. Anything you do for more than five seconds is working on something other than speed. If you are training at sub-max effort, you are training slow. 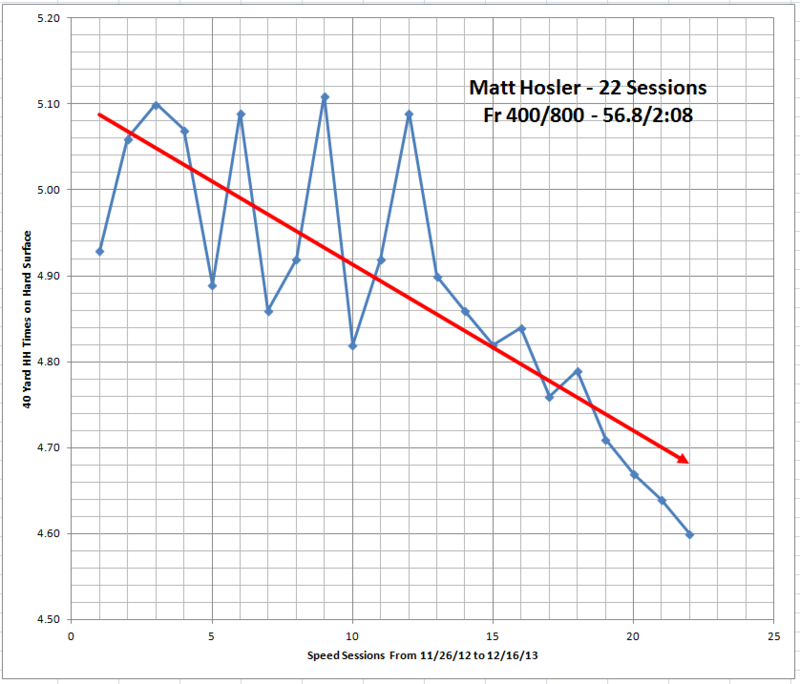 I argue that ALL off-season workouts should be done at max-speed. Sprinters should never run at less than top speed until in-season “lactate workouts”. We do lactate workouts twice a week during the season and meets are considered lactate workouts. If we have two meets in one week, that’s all the lactate work we do. If you ever observe one of our lactate workouts, you would call it sprinting. Why this emphasis on top speed? Geez, to me it’s strange to even have to answer this question. I argue that fourteen events (4×1, 4×2, 4×4, 100, 200, 400, HH, INT, LJ, TJ, HJ, Shot, & Disc) are based on speed … not 3rd gear speed, not 4th gear speed, … 5th gear !!! Most athletes can’t find their 5th gear because bad coaches focus on conditioning, endurance, and toughness … at the expense of speed. 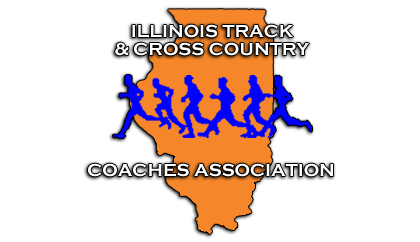 PN distance coach Andy Derks has assigned his top two 800 runners to my speed group this winter. Are 16 of track & field’s 18 events sprint-based? 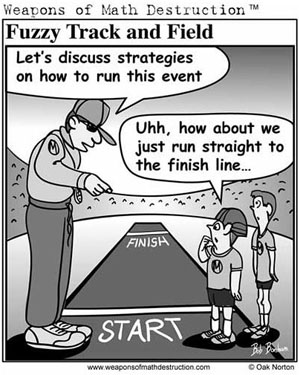 What he was trying to say was, “if you consistently train kids at high-speed, they will get faster and continue to get faster uniformly in a straight line”. Or at the very least, the Excel-created trendline will be uniformly straight. Wink. I do not require a 3-point stance. Runners can start in a leaning, relay position. My sprinters attending football combines typically run .15 to .20 slower than their winter best due to soft surface, no spikes, and a mandatory 3-point stance. I’ve done the RECORD, RANK, & PUBLISH thing for about 15 years now. I’m a spreadsheet savant. My “publishing” used to be a bulletin board. Now I publish on the world-wide web using Google Docs. One billion Chinese people can now check our speed rankings. 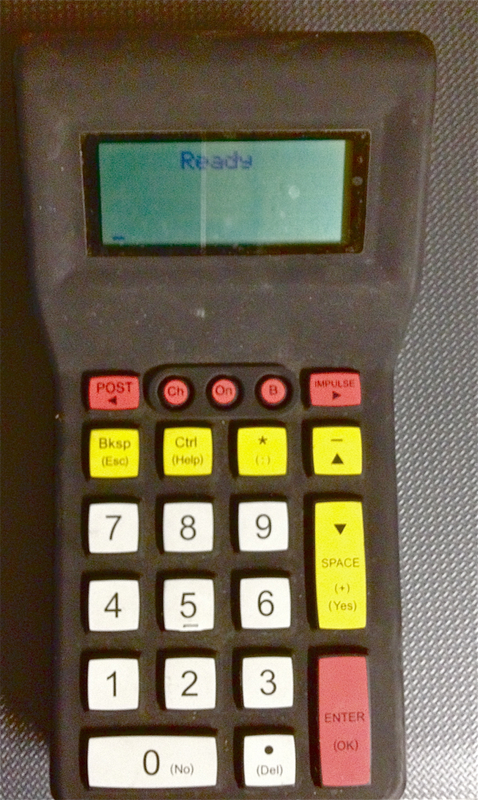 I purchased the Summit Timing System in February of 2009. It’s the same system used by my #1 guru, Chris Korfist, sprint coach at York. The cost is now over $2000. My friend, Lou Sponsel at Palatine Fremd, liked the system so much he bought two. This is the central unit. These are mounted on tripods. What you see above is considered one photo gate. Here is the Summit Timing System. 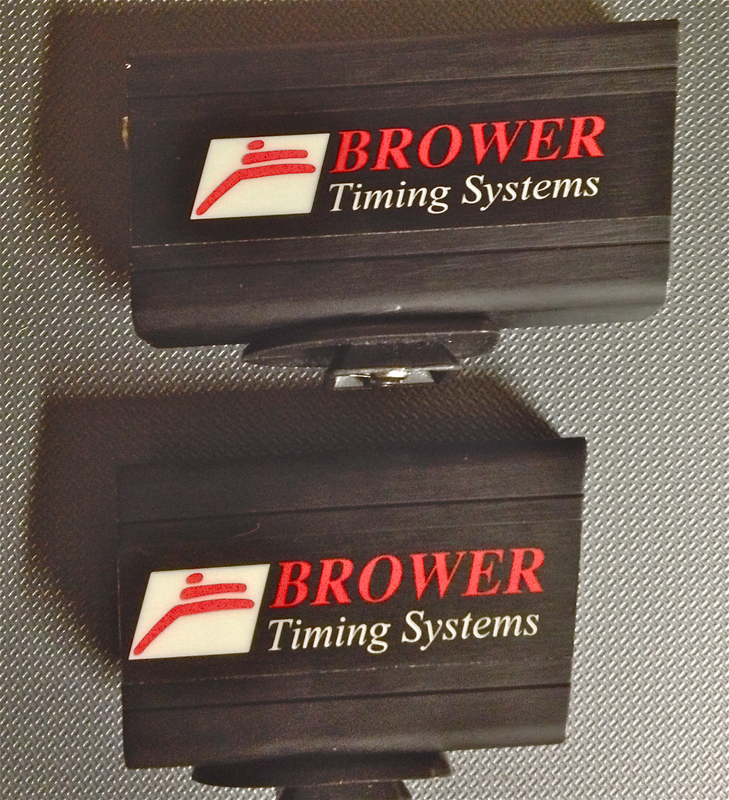 I have two sets of Brower photo gates. I also have a pressure mat. In addition, I have long and short wires and four tripods. I can’t imagine coaching without the timing system. It is sooooo motivating to sprinters. We use it during the season to do 30 meter block starts. For starts we use a pressure mat with just one set of photogates. I now have 5 years of 10m fly data and 30m start data. By the way, we do “X-Factor” workouts on Tuesdays and Thursdays. That will be the subject of another blog someday. Our kids lift for about an hour Monday through Thursday. The speed and strength workout starts around 2:30 and ends around 4:30, four days per week. We usually have 200 guys on our roll sheets. Around 120 show up on a daily basis. The elite group sprints then lifts. The younger group lifts first. For those of you who think that speed-based training is not “tough” enough … remember, we are doing high intensity work with full recovery for two hours, four days per week from November 25th to February 7th. Soreness is daily. If you seriously consider aerobic training vs speed-based training, I think speed based training is tougher (but cats like it). Let’s get to the data and that inertia thing. Let’s start with a general look at the winter program at Plainfield North. Below you see the average times of the fastest 50 kids in the program last year. 28 of those kids ran track, the rest played other sports. The indisputable fact … speed improved. Monday times are always faster than Wednesday times due to a three-day recovery (no workouts Fri-Sat-Sun). Despite the up & down nature of the times, the computer-generated trendline is impressive … I call it inertia. The times may vary like the stock market but the computer-generated trendline is indisputable … we get faster. Remember, the 10 meter fly times are actually the last 10 meters of the forty yard dash. I like this because it teaches sprinters to find that elusive 5TH GEAR. The two charts above show improvement over one winter, November through February, 2013. The numbers represent the average daily time of the fastest 50 runners in the group. I average each runner’s two fastest times in the 40 yard dash. I can trust 10 meter fly times (FAT), but I want to eliminate crazy hand held times. Example … if a fast kid runs 4.28 and 4.44, his recorded time is 4.36. The improvement is much greater for the slower kids. Once sprinters get fast, the margin for improvement gets smaller. We all understand this. The 59-second 400 runner might improve by 10% but the 49-second 400 runner would be thrilled with a 2% improvement. Quest Young on the left, Marquis Flowers on the right. Let’s look at an example of a talented freshman. Marquis Flowers ran 11.2, 23.1, and 51.2 as a very mature freshman. As a senior he ran 11.00, 22.00, and 49.98. In addition let’s compare Marquis to his best friend, Quest Young, who came into high school tall and immature. As a freshman, Quest ran 11.9, 24.17, and 53.00. His PR’s ended up at 11.00, 22.26, and 48.67. If there was a Mt. Rushmore for PN Track, Marquis and Quest would be there. Check out their best winter times. Two great runners with different rates of improvement. This graph shows pure speed (10m fly). Marquis was fast as a freshman. Both were fast as seniors. Let’s look at another example. Thomas Harris is a junior at PNHS. He plays in our award-winning band and only competes in one sport, track. As a freshman, Thomas ran 11.66 and 23.38. As a sophomore he ran 11.10 and 23.02 His major focus was in the relays where he ran 45.54 & 1:35.14 on freshmen relay teams, 44.06 & 1:31.75 on sophomore relay teams. He has been trained exactly the same as Marquis Flowers and Quest Young. Below you can see his progression from November of 2011 until now (December, 2013). I told Thomas recently, “Trees don’t grow all the way to heaven”. 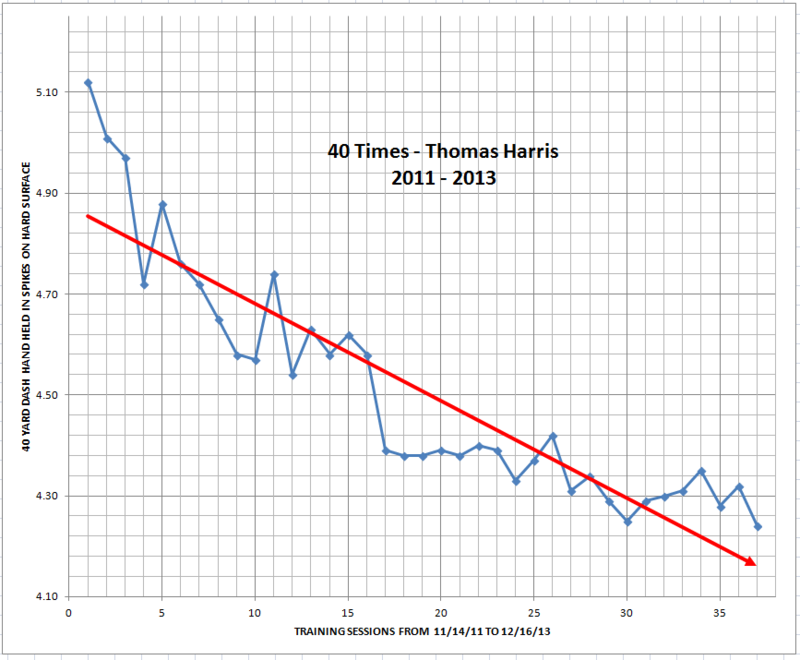 With his 40 time at 4.24, his improvement will now be small. He must start doing the little things … eating fruits, vegetables, and superfoods. Sleep will also be a key. Click to enlarge. 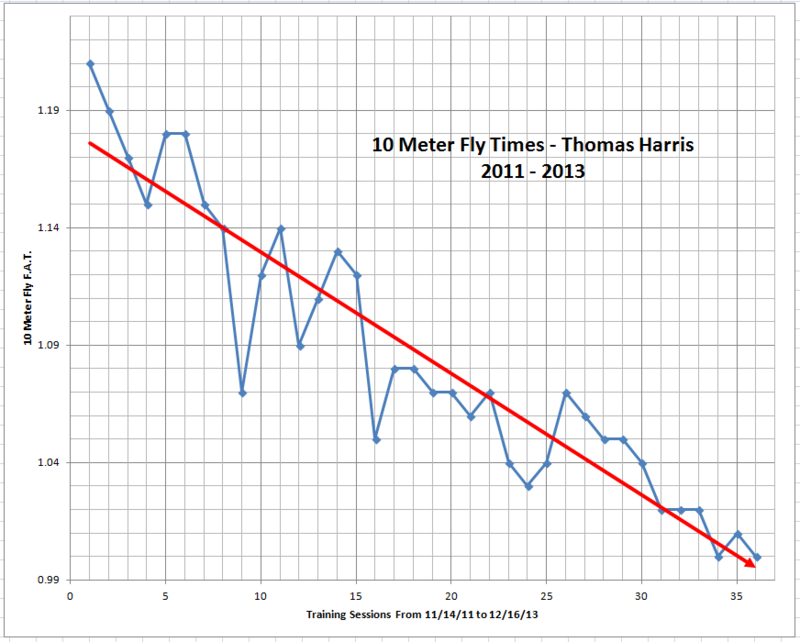 All six of the 10 fly times by Harris this year have been faster than his BEST of last year. He’s run 1.00 multiple times in December. 0.96 is our school record. On December 16th Thomas ran 4.24 and 1.00, ranking him #1 and #6 all-time at PNHS. It is interesting to compare similar guys, same age. Quintin Hoosman is a terrific running back on the football team. 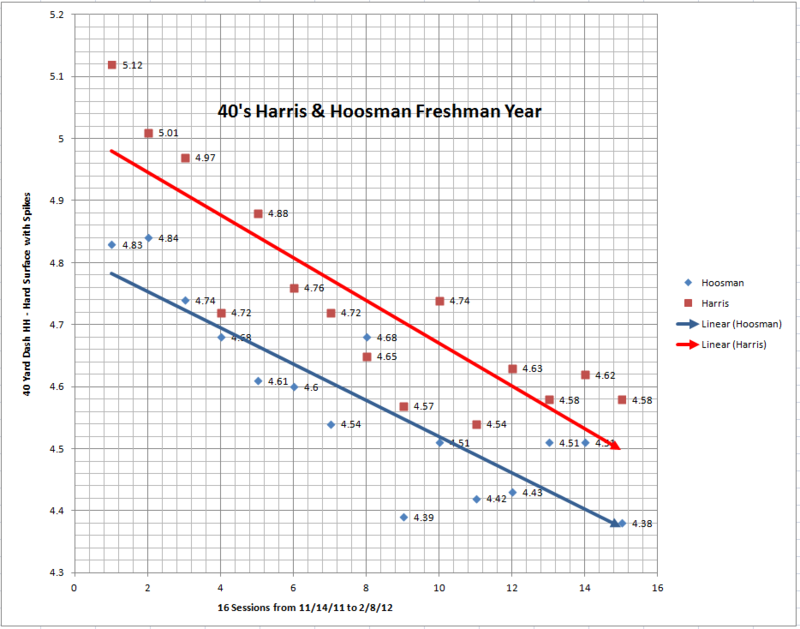 Here is a comparison of Quintin and Thomas, freshman year. Both improved. Both will be excellent track athletes as juniors and seniors. These two guys ran 4.29 & 4.24 yesterday. I could go on and on, sprinter after sprinter. Sure I could show you less impressive graphs with accompanying stories of injuries or weight gain … but those stories are the exception. In “The Sports Gene” by David Epstein (a must-read), he talks of “high responders”. Some athletes have natural genetic talent. Other athletes have the genetic gift of being a “high responder”. Some guys respond to speed training better than others. 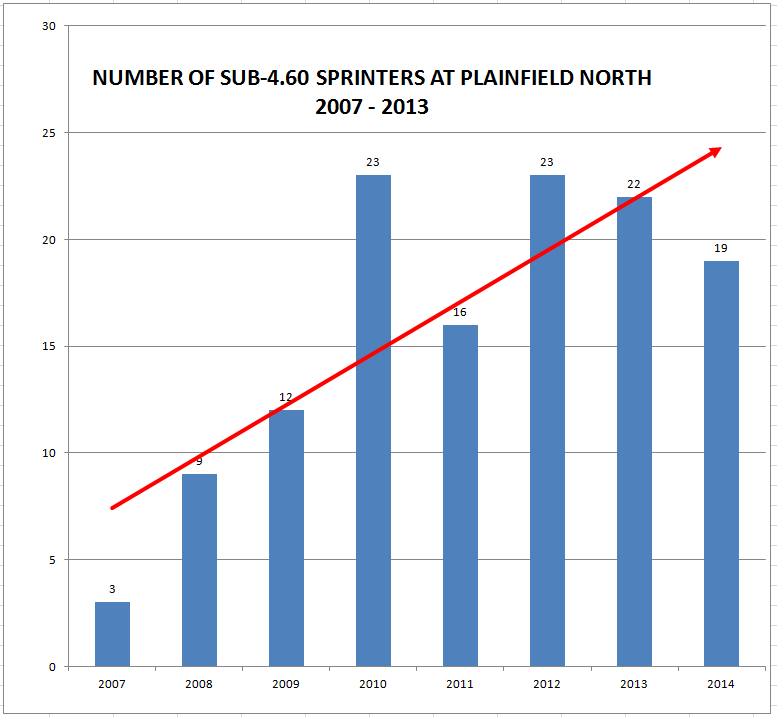 Let me finish with two graphs of my eight years at Plainfield North. 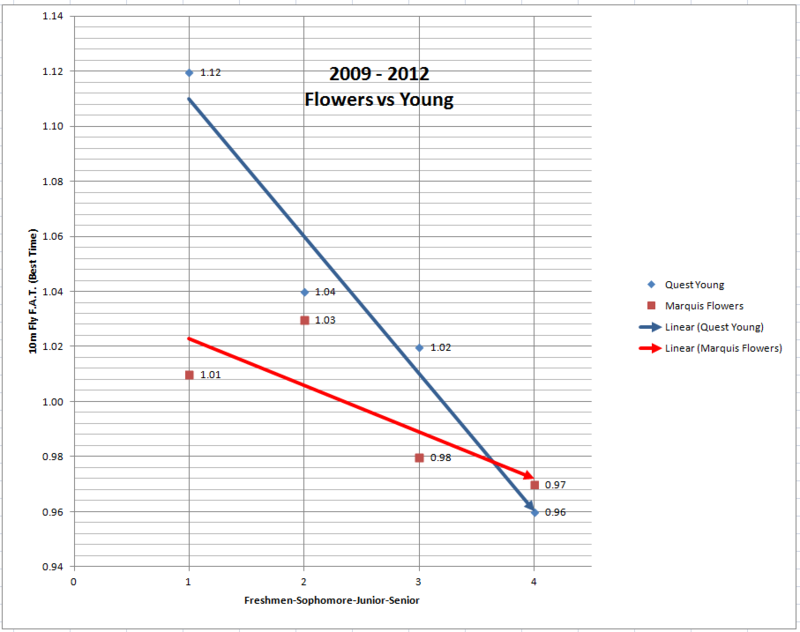 I will use 40 yard dash times since 10m fly times are only 5 years old. 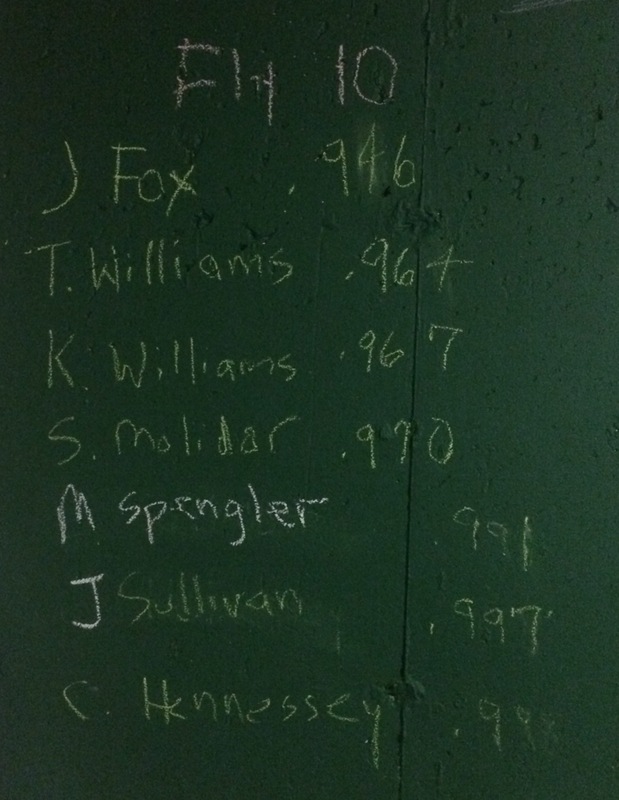 A year by year average sprint time for our 10 fastest guys in the school. We are a work in progress. Even though we only had 3 sub-4.60 guys in 2007, we managed to run 42.5 in the 4×1 and qualify for the state meet. One guy was REALLY fast. 2014 is obviously a work in progress. 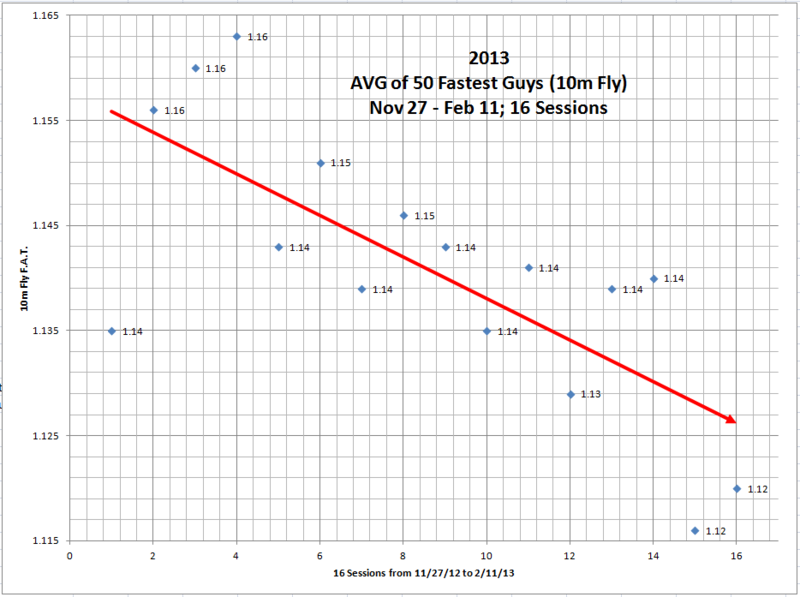 I hope to have 30 guys running sub-4.60 by February. Speed can be improved. It’s simple. Run Fast. Checkout the times of this year’s winter group. 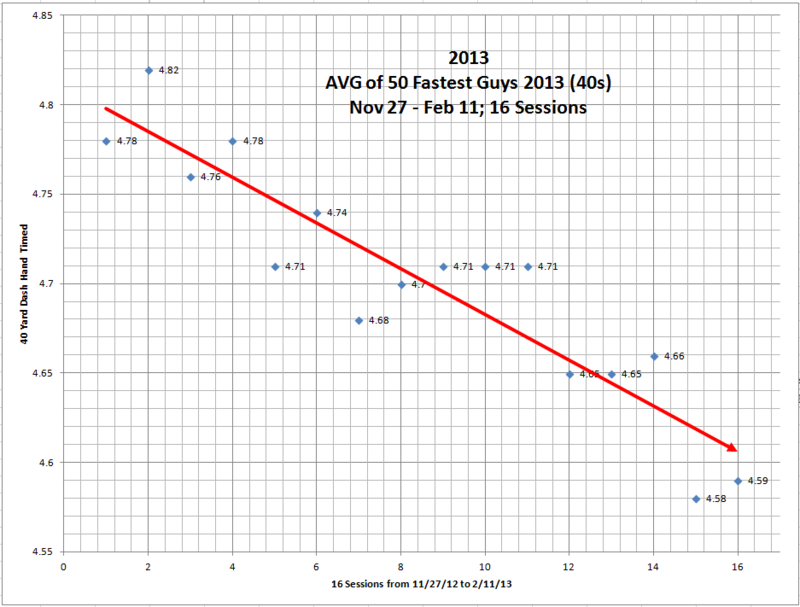 Check out their best & average times from the previous year found at the left. Winter 2013-14. I disagree with a progression from high volume to low volume. We don’t ever run 8 x 200. My sprinters never do Fartlek runs. Running slow does NOT improve speed. In 14 of our 18 events, an improvement in speed will improve performance. With all our sprinters, we develop a speed base and then progress to some lactate training when the season begins. I feel sorry for all you Clyde-Hart-loving cross country coaches … this talk of a phosphate-fueled sprint training program in the off season must make your head spin. Go ahead and start making your rebuttal graphs to show how aerobically-trained sprinters improve just as much as my cats improve. Let’s assume that both off-season programs work equally well. Which program will attract cats? Will cats enjoy Fartlek running on frozen tundra? I choose to accept the fact that today’s athletes have lived indoors most of their lives. They have not lived hard lives. They stay up late, sleep late, and are kings of their domain. Can modern athletes be expected to enjoy the torture that I went through as a track athlete in the 70’s? I hated it. Don’t misunderstand me. These products of the “easy life” can be trained to become strong and fast and when they compete, they will do so with the heart of a lion. After all, they are cats. They just won’t be doing tempo runs through snow drifts in December. My program gives me a way to be successful. As a bonus, I get to coach talented kids that inspire me with their love of track & field. Unlike Clyde Hart at Baylor, I can’t recruit the best athletes on the planet to come to my school. To model your program after a college coach who has benefited from such a talent advantage would be a mistake. Is college excellence based on coaching? College sports are professional sports without a draft. The best schools get ALL of the first round picks. Go ahead and pencil in Kentucky, Duke, Kansas, and North Carolina into your basketball Final Four for the next 20 years. It doesn’t matter who the coach is … their talent wins. So why would a high school coach copy the program of Clyde Hart just because Baylor’s men have won 20 NCAA 4×4 titles? Baylor’s off-season program did not turn generic athletes into All-Americans. In the early days of speed-based training, I felt very alone. I no longer feel alone. Boo Schexnayder and Latif Thomas believe in developing a speed base. Chris Korfist (York) is constantly testing his athletes. Surprisingly, some Republicans have grudgingly accepted Newton’s First Law of Motion (Inertia). Give me the fastest kids in my school. Let me train them to get faster and faster. I will RECORD, RANK, & PUBLISH their times for the whole world to see. With testing, my athletes will become competitive and motivated. They will get faster. And, as we all know, once an object is in motion, that object will continue with the same speed and in the same direction unless acted upon by an unbalanced force. 10 meter fly times. If he lived closer, I would send my sprinters to Chris Korfist in the summer. He’s the best. 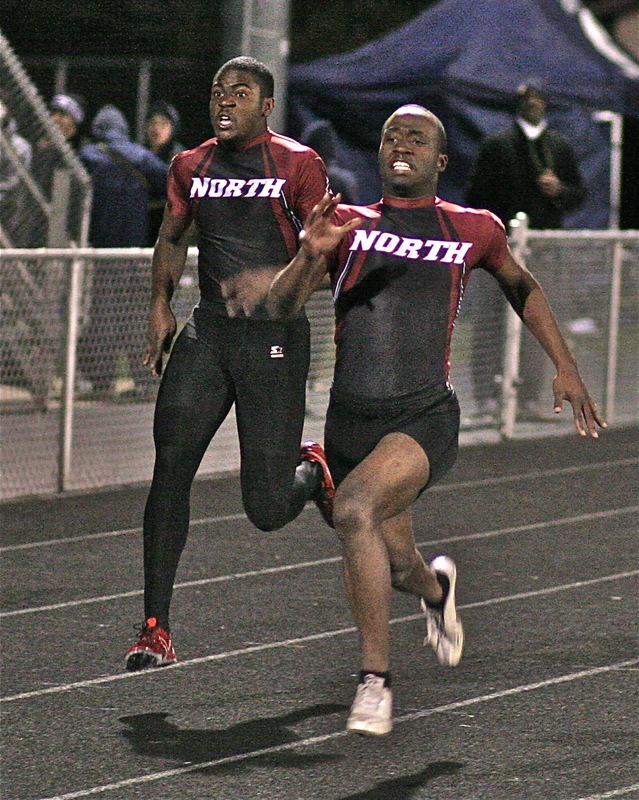 John Fox, Tarrence Williams, Khara Williams, and Jimmy Sullivan ran on York’s outstanding sprint relays of 2009. At the state meet they ran 41.89 and 1:26.06 in the finals (4×1, 4×2). Fox ran the 100/200 in 10.82 & 21.96 in the finals in 2008. Jimmy Sullivan ran on York’s 3:17.84 relay team (4×4) in 2008. If you do the math and take each 10m time x 10, then add 1.00 second for the start and 0.50 reduction for each of the three exchanges, you get a 4×1 time of 41.24. On a perfect day, this team was capable of 41.24. Chris Korfist’s 10m flys are run on the road in front of his house … hard surface, no spikes. Times are never perfectly comparable because of uncontrolled variables … surface, shoes, wind, timing system, incline, decline, etc. However, if you can run sub 1.00 in high school, you are very fast. But … you are not as fast as Usain Bolt. Based on Bolt’s Berlin time, his hand-held 40 yard dash time would be 3.96. His time would be faster if he was allowed to lean into his start from a standing position. At PNHS we allow upright leaning starts (like relay starts). Bolt’s 30-meter start time (remove reaction time) would be 3.63. Our school record is 3.95. The start is not where Bolt dominates … it’s those 0.82, 0.80, 0.81, 0.82 splits in the 2nd half of the race. Bolt ran 40 meters in 3.25 seconds. 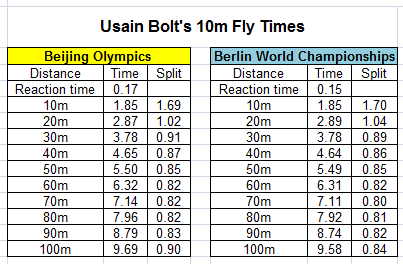 For perspective, at 0.80 seconds per 10 meters, Bolt would run the mile in 2:08.70 … a speed of 28 mph. At a fly time of .80, Bolt could anchor the 4×4 in 32.0 !!! As the famous jazz musician Thelonius Monk said when asked how jazz seemed to come so easily to him, he replied, “Hey man, simple ain’t easy.” My program is simple but it’s hard work. My first year at PNHS, I timed over 10,000 40s. I work for two hours on the computer after every winter speed session. Simple ain’t easy. We are a couple months away from our first indoor meets. Until then, teach to the test. RT @pntrack 3 mentions in my most recent blog.Will always remember your great sessions at WISTCA http://t.co/fgtu8NxYX8 /Great time & event! Great work here! I think you’ll find my session at ITCCA on using Freelap Timing relative to ASR speed regression projections interesting and corroborative. Tony, I know you mention that your sprinters run 5 second sprints and then recover. What are their typical recoveries during a 2-hour workout? I saw 20 seconds mentioned somewhere and am not sure if I got that wrong. I know that would mean that they are in terrific shape (of course) to do another 5-second sprint after only 20 seconds of rest if that is the case. Would a “normal” person (42-year-old recreational runner who wants to improve his 200-meter speed) take as long between 5-second sprints as they feel is necessary? I am confused because I also saw the reference to runners taking three 40-meter sprints or two 40-meter sprints if they are not track runners. Sprinters should never have a two-hour workout. The basic rule of thumb would be this … rest long enough to repeat the previous effort. If that can’t be done, the workout is over. Tired sprinters need to take a nap, not trudge on. My track kids do three 40’s during our winter training. Those who speed train with us who don’t run track may only do two. Sorry for the confusion.